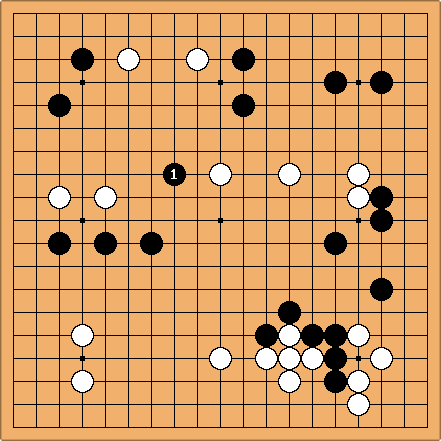 If you have two weak groups at all close on the board, the opponent's plays in between them will have attacking force on both sides, creating a difficult situation for you. One should not therefore develop them towards each other (unless you can force a connection) - the plays your opponent makes to keep them split up will look even better. One should develop them away from each other. A splitting attack will often succeed in killing one of the groups. In any case being subject to one is a way to lose control of the position. Strong players are averse to making two weak groups. BobMcGuigan: At a U.S. Go Congress several years ago I asked Nakayama Noriyuki sensei what the most fundamental idea is in middle game play. He thought for a while and replied karami. I was familiar with karami as a splitting attack on two vulnerable groups, but I have since come to see that the idea of "splitting" has much wider application. It could refer to almost any move with a dual purpose. For example a move which simultaneously threatens to invade a framework and erase thickness could be a sort of splitting attack, because it threatens two different "attacks". Likewise a probing move that forces the opponent to choose between two future courses of development might also be considered splitting, in a sense. This diagram shows the first move (Black 41) of a famous splitting attack from a game between Honinbo Shusaku and Ota Yuzo (see Invincible pp.244-248 or Appreciating Famous Games p.250 for the game record). Black 1 is strikingly evident once you see it, but it is still quite impressive, simultaneously attacking White on three fronts. Of course, the finer aspects of Black's attack reveals itself in the moves preceding Black 41 and in the ensuing fight, where he managed to keep White separated and in the end had him faced with losing one of his groups. White resigned after move 123. 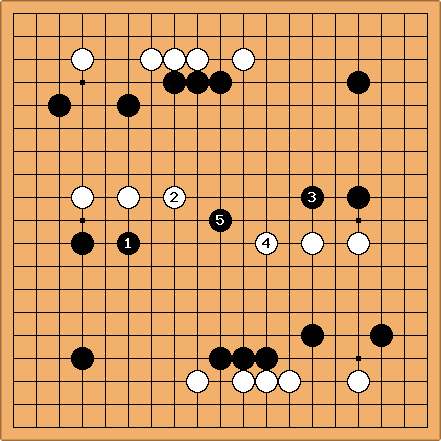 Kato responded to Black's counter pincers in diagonal corners in a symmetrical way, paving the way for . White was forced to resign in 165 moves.